So I also believe that every musician and producer ought to have access to some of the privilege I’ve had in regards to learning music theory and ear training. And I find that when my own creativity is lacking, I go back to listening deeply to sound and music. There are in fact many resources online for deepening your music knowledge, but it’s interesting at least to observe how a software maker like Ableton gets involved. 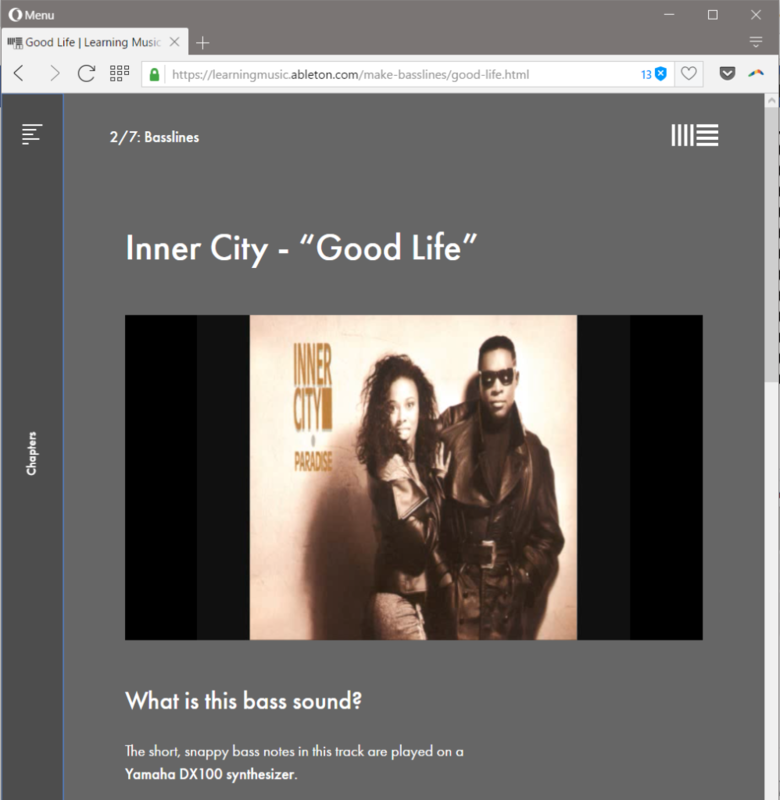 Having already established a book (Making Music) and a conference that takes on these issues at least in part (Loop), they now have unveiled a browser-based learning tool. If you’re entirely new to music making, the tool will walk you through the basics of how rhythm, melody, and harmony work, from the fundamentals to a sprinkling of more advanced topics. It’s a course in music theory and one in recent music history. Oddly enough, it’s worth a browse through these topics even if you do have some musical training. The reason for that is the same reason likely to engage new users: there are great musical examples, from drum and bass classics to pop. I get the same kick out of going through these as I have in the past teaching music fundamentals. If you love music, the fundamentals never get old, and never get less profound. It’s great fun breaking down bass lines and rhythm parts and musing on form in favorite songs. The Learning Music site makes its own argument for that. First, this is really Ableton software – and Ableton is first and foremost a software company. That might not be immediately obvious, but from navigation to interactive tools that let you play with pitch and rhythm and even export to Ableton Live, it’s clear that Ableton’s competency in software is relevant. Of course, part of what makes Ableton who they are is also their design language and clarity, and that’s also a major part of the presentation and user experience. And there’s something to learn from this. You see what Ableton is as they extend outside of Ableton Live, in regards to providing experiences in browsers and mobile. And you see, conversely, what browsers and mobile can do in teaching music. There are plenty of interactive learning examples online, but I think that “export” feature – the ability to integrate with serious desktop features – represents a kind of breakthrough. At the same time, let me raise a serious concern here. So here’s my hope. I hope that music educators check out Ableton’s Learning Music. I hope you do, too. I think it’s a reminder even to me of the importance of sharpening my own ears and sharing that knowledge with others, and I’ve been saturated in this for a long, long time. But I hope we also start a bigger conversation in the music technology industry about the state of music education, knowledge, and documentation. We should both consider what we can do internally (as Ableton did with this site, and as CDM can do in its own ways), and what solutions lie beyond us, too. I think Ableton doing this site might be an extra spark to making that happen. Now, if you’ll excuse me, while playing around with this I randomly came up with a melodic figure I really like, and I want to develop it into something. Time to fire up Ableton Live.